As technology continues to grow exponentially, creatives have to continue to grow with it. 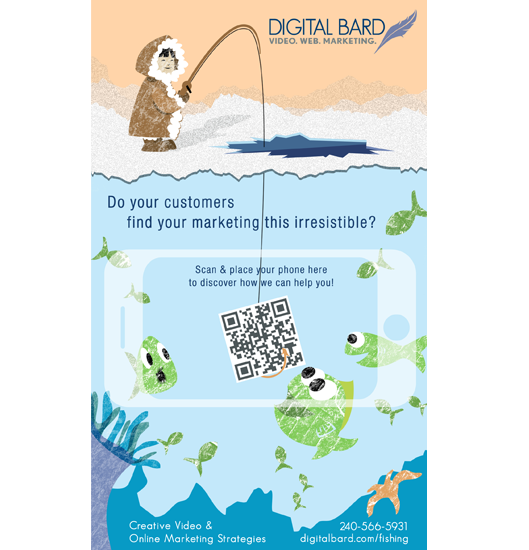 This advertisement for Digital Bard, shows just how close integrated marketing can be. Using QR Code technology, this print ad more fully immerses the reader into this particular illustrated world. Feel free to test it out by scanning the QR code, or watch the video to the left to see what happens if you had scanned the QR code. This received the Award of Excellence (GOLD) in the 2013 Communicator Awards.